Bathrooms tend to be the smallest rooms in a home, and I think that may be why some people are hesitant to add fun color to their water closets. While you might not feel comfortable painting your bathroom walls a deep red (like my daughter’s powder room), there are many ways to infuse your favorite shade to create colorful bathrooms in your home. 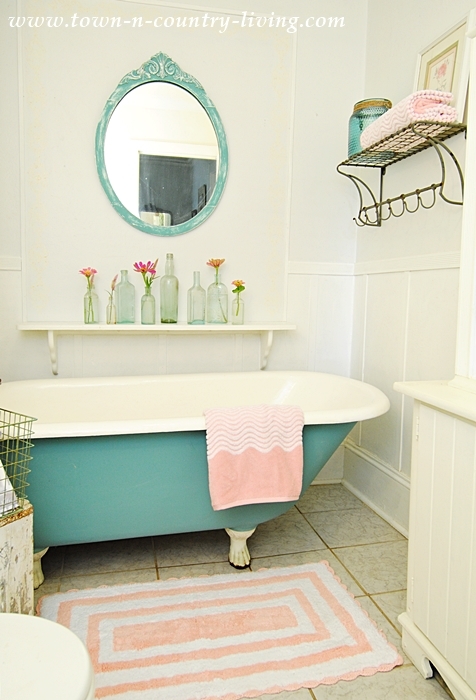 If you’re blessed with a claw foot tub, consider painting it your favorite color. Add a bit more of that same color in your choice of curtains. 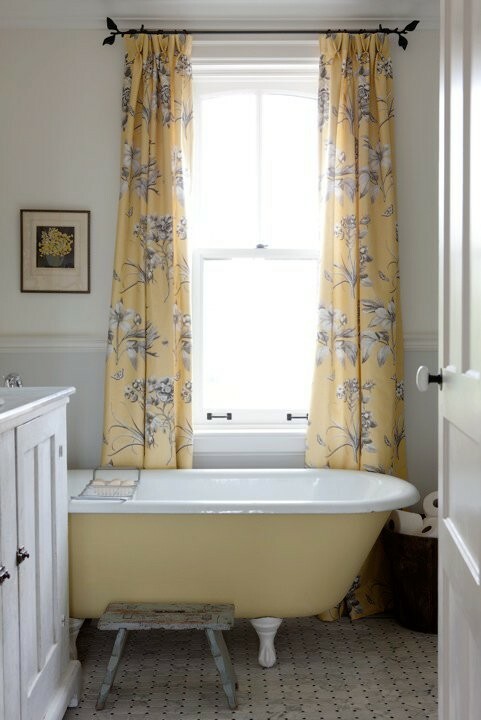 Here, a soft yellow graces a small farmhouse bathroom. The result? An elegant and charming space. When half of your bathroom wall is tiled or planked, it’s a great opportunity to color the untreated half with a fun, bold color. 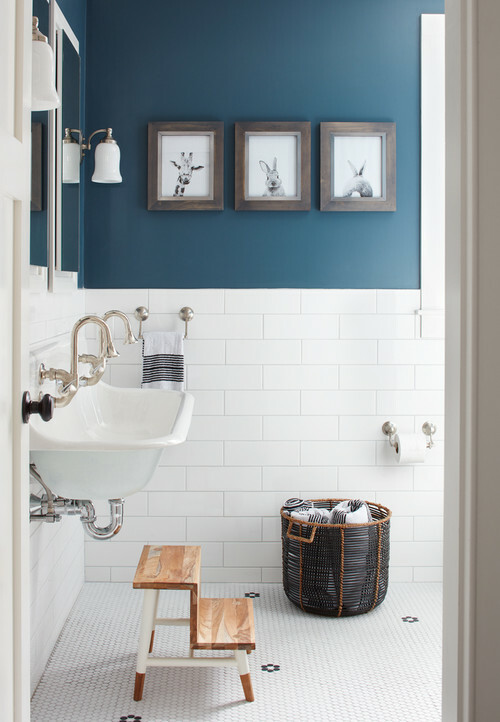 This country style bathroom enjoys a rich navy blue that creates a cozy look. 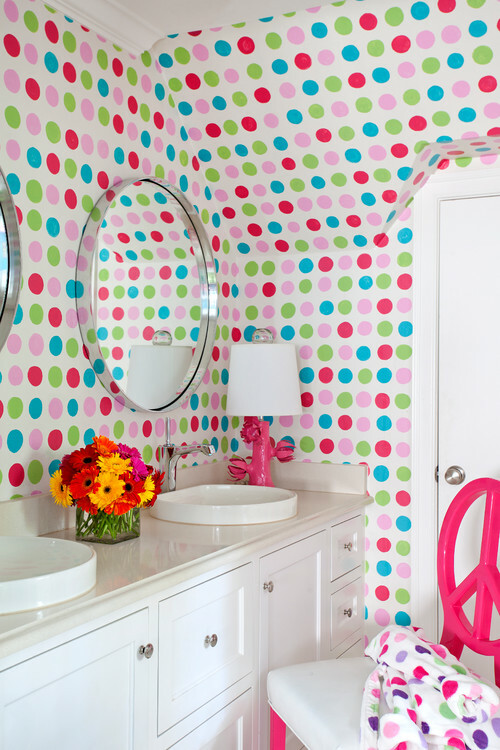 How fun is this bathroom with its bright, polka dot wallpaper? 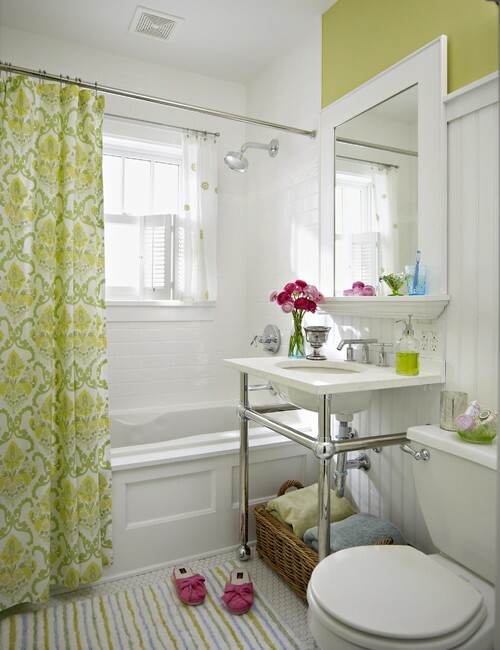 If you’re a fan of colorful bathrooms, you’ll probably love this space. It’d be a great treatment for a teen girl’s bathroom. A whimsical peace sign chair in hot pink completes the look. Keep in mind, adding color to your bathroom doesn’t mean you have to go bold. 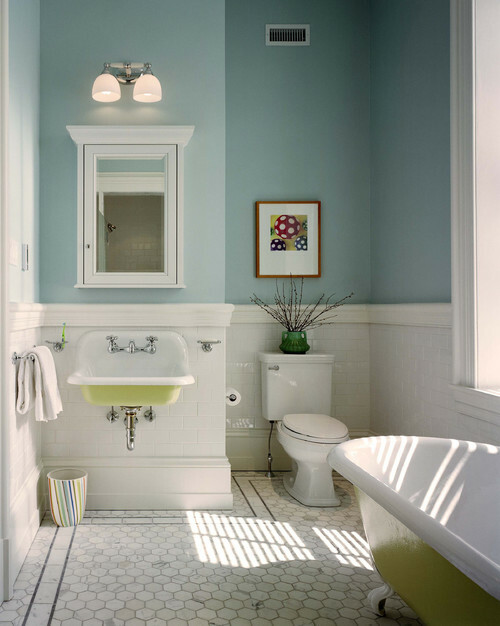 Soft blue on the walls and pale lime green on the tub and sink adds color without being overpowering. 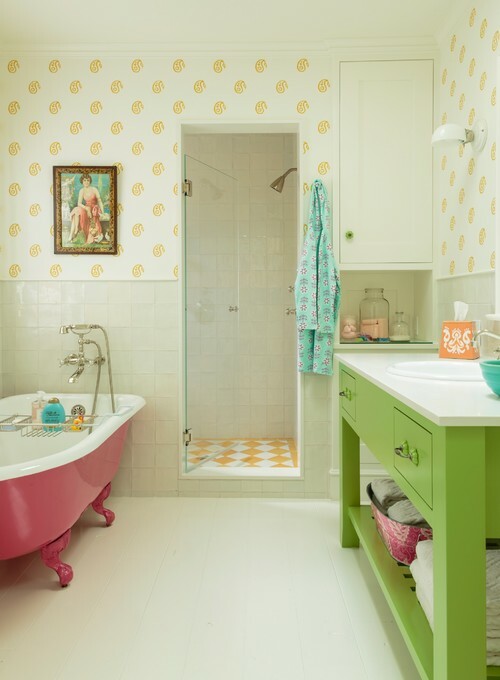 Pink and green are one of my favorite color combinations, and this colorful bathroom pairs them together beautifully. Even yellow gets to make its appearance in this cheery room. Here’s a room fit for a queen … or a princess … or me! From the tub to the floral curtains to the fun chandelier, this bathroom has my name all over it. Bold blue works in this dramatic room that’s grounded with dark floors and lightened with white walls. Such a fun choice of color! The first time I saw apple green used in a small bathroom was on the show, “Queer Eye for the Straight Guy.” Do you remember that show with Tom, the decorating guy? I love the fresh appeal of apple green and of course, it looks great here with pink flowers and slippers. An easy way to test a color in a bathroom is to start with a shower curtain … or even painting just one wall to see if you’ll like it. 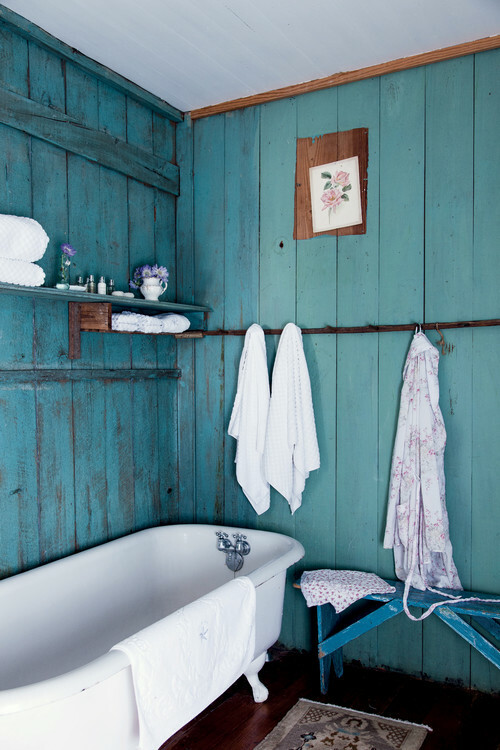 Colorful bathrooms come to life with even the softest of color. 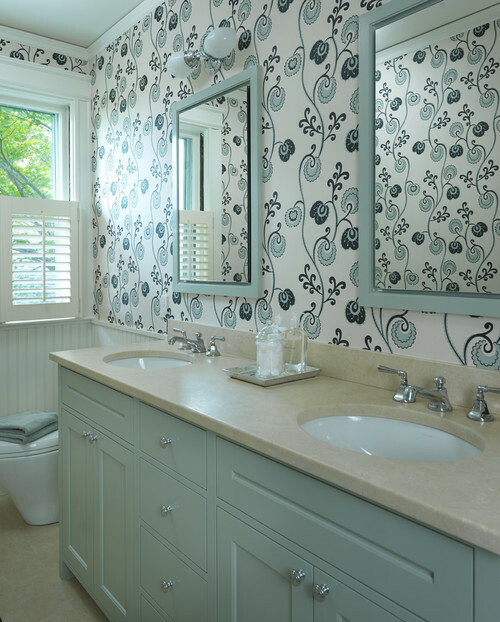 Add a fun pattern with whimsical wallpaper in the same shade as your vanity. Love this room! My downstairs bathroom used to have a floral wallpaper in soft pink and green and sometimes I miss it. I like to hang my own wallpaper. It reminds me of wrapping a big gift. I’m including this bathroom for my daughter. She adores the color pink. 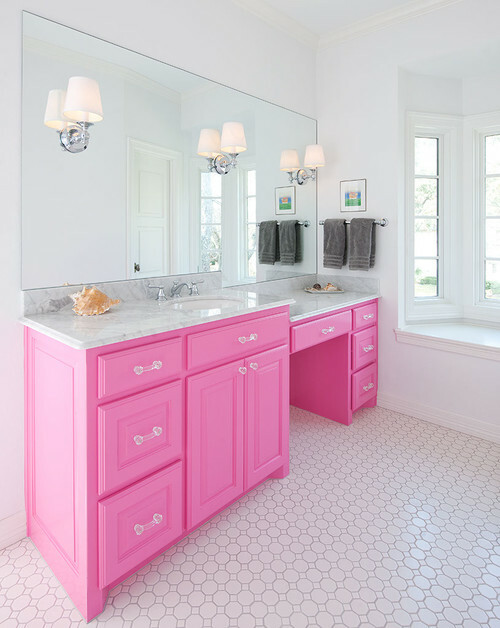 Painting your vanity is an easy way to add a shot of color. 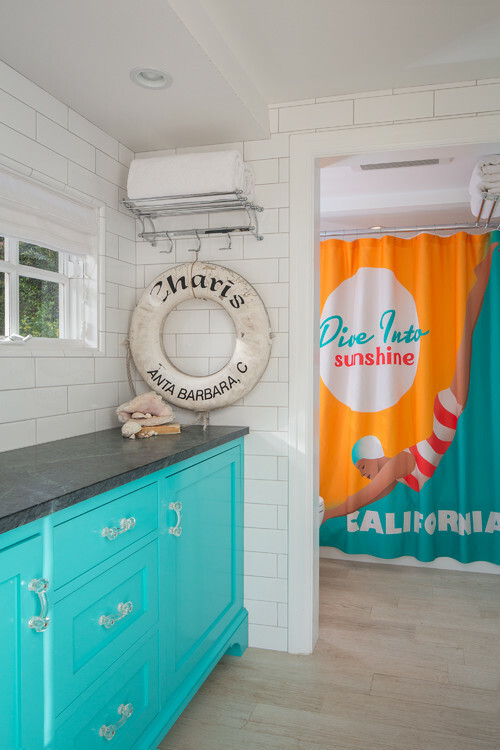 How about a graphic shower curtain for your bathroom? This one takes center stage in a coastal bathroom. 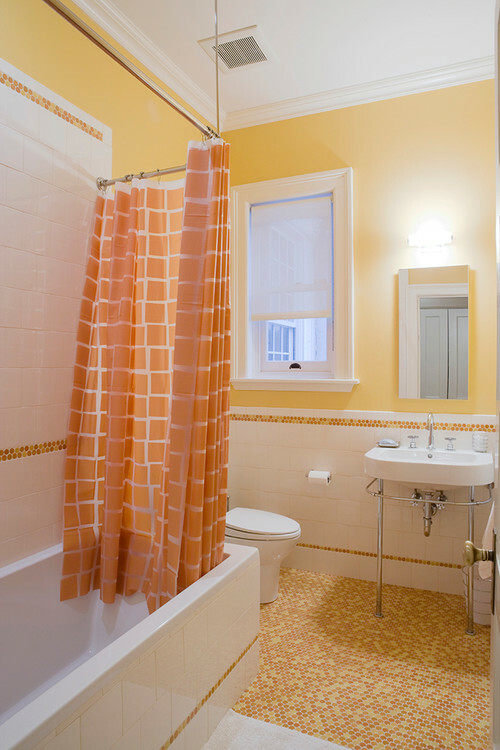 Normally I wouldn’t think to use orange and yellow together in a bathroom, but these soft hues create a cheery space to get ready in the morning. Note how the same colorful tile is used on both the floors and walls. 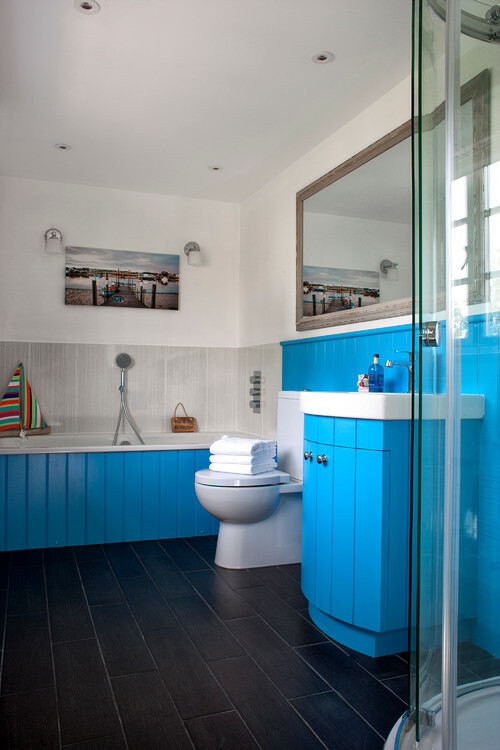 Blue is popular in colorful bathrooms … it’s serene and peaceful, no matter what the shade. 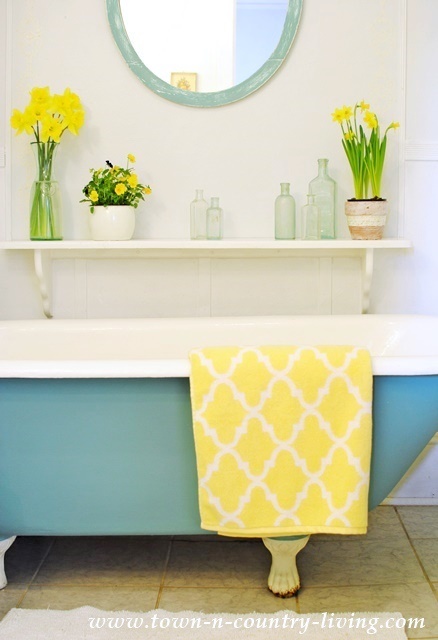 In my own bathroom, I painted the claw foot tub aqua and added yellow accents to brighten it up. To create softness in my downstairs bathroom, I swapped out the bright yellow for salmon-y pink. So if you’re a little timid about adding color, simply swap out your textiles which are easy to change. What colors do you like to use in your bathroom? Oh these photos sure make me want a claw foot tub! And I love your bath. I have been following your blog for a while now and your whole house is wonderful. I am starting demo on my guest bath soon and I can’t wait to get a new look. You have included some beautiful bathrooms. It reminds me how much I love wallpaper.